As a show of support for community and the future of dentistry, Dr. Khozema and Dr. Rokshana Chherawala recently sponsored a Conference Room and an Operatory Room at the University of British Columbia. The Conference Room is intended to foster education and patient-focused learning at UBC while the Operatory room is designed to allow students to explore the latest in dental techniques and technologies in a prestigious learning environment at the University of British Columbia Faculty of Dentistry. The Drs. 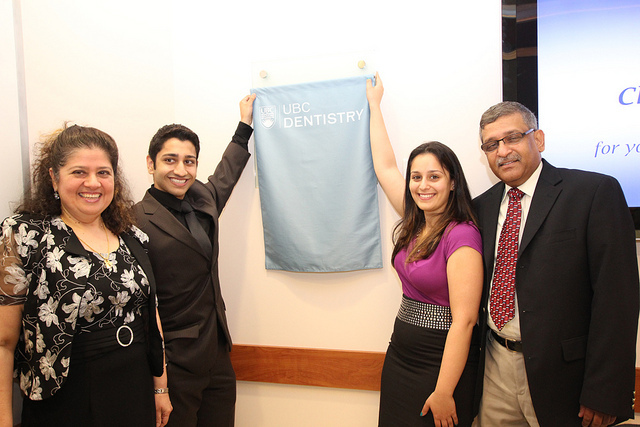 Chherawala value community – and improving the lives of others through healthy smiles and are incredibly proud to support the University of British Columbia’s Faculty of Dentistry and the next generation of dentists. For more photos of the event, please visit the official ValleyFair Dental Facebook page. For a patient-focused experience at your dentist, contact ValleyFair Dental and book your appointment.